If you ask people who have their own business if they love it, many will tell you that they have a love/hate relationship. They might love what they do in terms of the product or service that they deliver but they don’t love the bits and pieces that they need to do in order to run the business successfully. In other words, there is no one in this world that loves his or her business 100% of the time. Working for yourself is tough and you don’t want it to lead to resentment. Resentment could mean that the thing you love to do, the thing that makes you get up in the morning, could be the thing that you resent most. But you can avoid this by setting some tactics in place to help you (and your sanity). Work out what to do first. Prioritising your workload sounds like an obvious thing to do in business, but many business owners don’t see prioritisation as a priority! Funny huh? First things first, get everything you do down on paper or in a project management tool like Asana. Then sort the projects or tasks into categories by client or due dates. 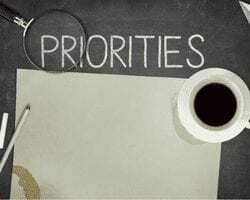 From there, develop a list of high priority tasks to complete. By setting the priority, it will enable you to park certain tasks in your mind and focus on what is important – instantly freeing your mind and lowering your anxiety. Write down all of the tasks you have to do in your business, and then work out the things that you really don’t like doing (or perhaps even despise). It might be booking appointments, organising events, designing a presentation, create a graphic for your Facebook banner, sending out invoices, or even following up on client payments. Think about outsourcing some or all of these specific tasks to a bookkeeper, a virtual assistant (an assistant that works in your virtual office), a graphic designer etc. Tell your friends and family what you do. Working in your own business can seem more like a hobby to those closest to you and this can really work against you in setting boundaries. It’s not that they’re trying to be mean or don’t care, its more that they don’t understand where you’re at. By sharing what you do and letting them know your hours of work and that you need really focus within that time, you can decrease your anxiety levels around friendship and family pressures. From my own experience, I can attest to the success of sharing what you do with your friends and family. It has really helped me to get to a place of peace, rather than frustration! Recently I was introduced to the 90-day plan and it rocks! Set a big-arsed goal for your 90 days that includes a dollar figure and a project. Then breakdown the first 30 days with all the things you will need to get started to move toward your goal. Then break it down a step further – put your tasks in a week and then daily. Even though you will still be doing all of the same things within that period, you will feel as though the end project is not so scary and that you are really getting things done as you move through each of the tasks. Winning! Stop being someone you’re not. Being a marketer, I often work with clients to get to the core of who they are and not just what they do. But in this instance, this is about being authentic to who you are. It’s sounds simple enough, but when you’re faced with working with many different clients it can seem as if you have to be a no-nonsense person for one client and more of a relaxed person for another – its exhausting. If you step back and really look at who you are and how you work, try sticking to that when you’re dealing with clients. It is such a relief to not have to put on the mask to meet their expectations. Another facet of this is to consider a DISC profile. Essentially it is a self-assessment that you complete to work out how you operate in your life. It may uncover that you are more of a details person or perhaps a get stuff done person. This is really invaluable in determining how comfortable you are in the way that you work. For example, if you complete the DISC profile and end up being an S, you lean toward a softer more nurturing side, so rather than trying to be an over the top, strong and demanding persona, stick to what works best and connect on a more personal level. It is important to remember that one profile is not better than the other – it is more that power is knowledge in operating your business from your sweet spot. To undertake your own (free) DISC profile, visit Tony Robbins. By stepping back from your business and ironing out some of the big picture pieces, you can really get to the things that need to be done. It turn, you’ll feel more focussed and more accomplished. But best of all, you’ll have the opportunity to fall in love with your business again. This article was first published in Dynamic Business April 2016.